Two pricing options to suit your unique training needs, but never a per-user fee. Train employees, volunteers, and members with an LMS system that has the features you need with a known total cost of ownership. TOPYX® enables organizations with diversified workforces to scale employee training with less cost and friction. Reduce the time and effort it takes to train your workforce to become productive. TOPYX is ideal for enterprises, governmental institutions, associations and nonprofits with large or complex framework. Choose us today and enjoy unlimited usage. Deliver the best training to your online learners. Our easy-to-use software is intuitive and comprehensive. Q: How is TOPYX Essentials different from TOPYX Expanded? A: All of the standard non-integration components are available on TOPYX Expanded including mobile and texting. Q: Can you add on different integrations to TOPYX Essentials package? A: TOPYX Essentials clients could add the following at the current rates: SSO/API/FTP, Admin service and/or newly created support packages, Languages, White label, Secure email. Q: What is not supported in TOPYX Essentials? A: The following integrations and features are not supported in TOPYX Essentials, but included with TOPYX Expanded: eCommerce, Mirror, Customized work, Webinar. Q: Does TOPYX Expanded and TOPYX Essentials have a time bound contract? A: Yes, each package has a year long contract. During this period you are able to add integrations and other features. With our referral program, you can earn a commission for referring a new customer. We seek organizations that want to improve their learning and development process to simplify the internal educational procedures for an organization. 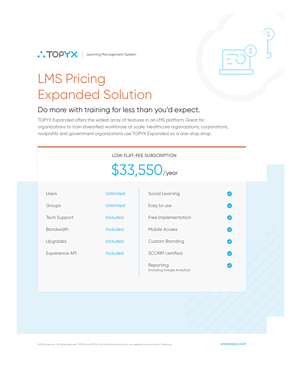 TOPYX LMS maximizes efficiency and employee performance, and we’re extending the opportunity to you to share with others. We reward referral partners for recommending our LMS platform to their clients. One referral that becomes a client could be worth over $5,500! Have a company in mind? Refer them to get started! See how the TOPYX LMS can work for you.